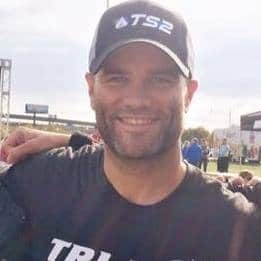 Nick Tranbarger is the Head Coach and Director of TS2 Coaching. He is also a USAT Certified Triathlon Coach. His interest in endurance sports started as he was studying Physical Education and Exercise Science at IUPUI in Indianapolis, IN. Knowing that no message is best spread by someone whose personal actions don’t support it, he began cycling to benefit his own personal health. After college, Nick has spent the last decade working as a physical educator, student mentor, and school administrator in central Indiana. He has a true passion for investing in his students and coming alongside each of them and their families as they pursue a true education. He believes his job is to pour out the gifts that have been so generously given to him by his mentors to the next generation. As Nick continued his own physical training, his interests began to drive him towards different endurance related competitions. He has competed in cycling events (a State Champion in the 40K time trial), running events (5K to the Marathon), and triathlon. Triathlon is where he has found the most personal enjoyment. He has competed locally and nationally, and has achieved the honor of being a part of Team USA for the sprint distance triathlon, as well as Long Course triathlon. Nick also has competed against the World’s best at Ironman World Championships 70.3. Some of his race results can be found here. As a coach, Nick is committed to building a real relationship with his athletes by investing in every aspect of their lives. True growth can happen when the spiritual, physical, and mental portions of life become one and work together towards a common goal. He asks a lot from the commitment of the athletes with whom he works, but is 100% devoted to giving an equal commitment back to them. Whether it be encouragement, motivation, reason, or something else, Nick will always do his best to speak to the individual needs of each athlete. Being a husband, father, friend, and employee enables Nick to understand the demands of real life. He will always work and plan with each individual to help make their dreams a reality. Join in the action by dreaming big and chasing goal! TS2 Coaching is here to support that journey. If you have any questions for Coach Nick, please email him below or at Nick@TS2Coaching.com.